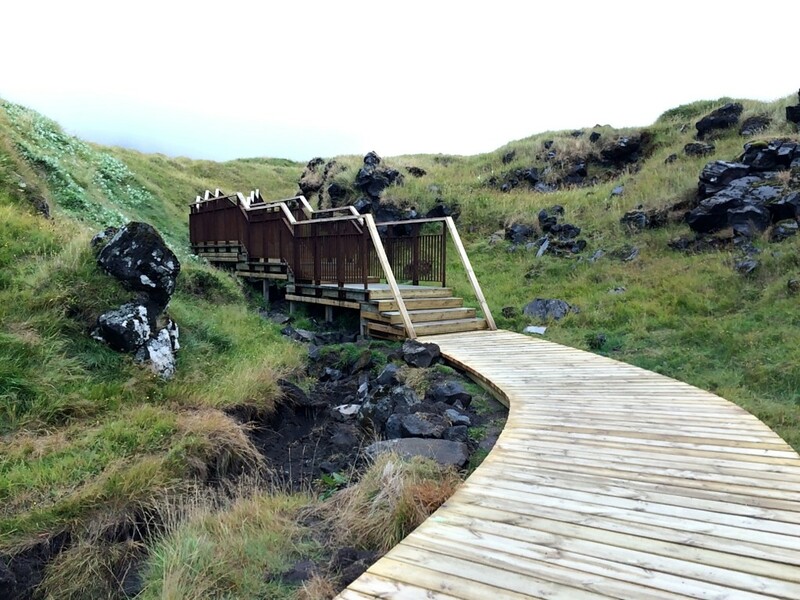 Of all my favorite short walks in Iceland, one of the best lies along the coastal cliffs from Anarstappi to Hellnar. Our overnight stay in the Borgarnes Hostel across the street from the Settlement Center had been surprisingly comfortable. It doesn’t look like much from the outside, but the inside was clean and the beds fresh. We’d breakfasted on the wonderful sweet rye bread of Iceland, toasted, with fresh fruit and herbal tea. 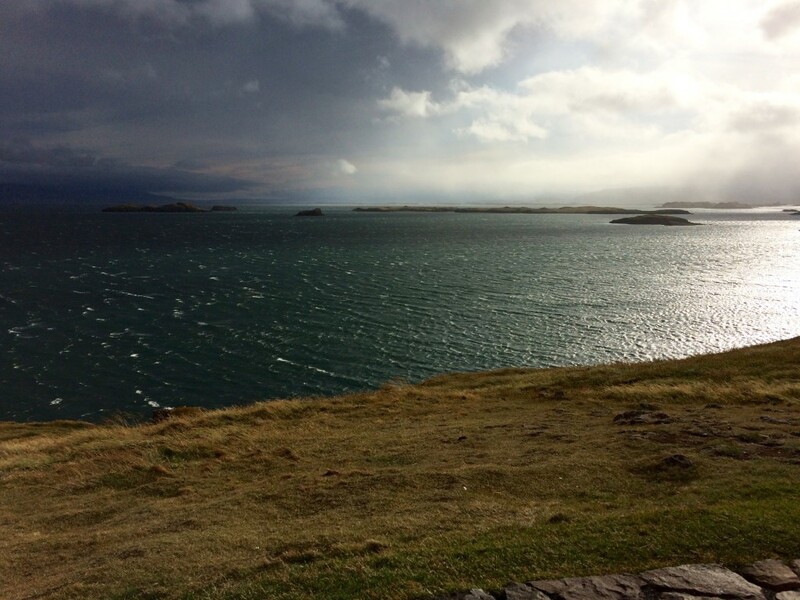 The brisk morning wind felt invigorating as we set out for the Snaefellesnes Peninsula in West Iceland. 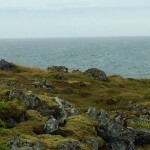 As we began our walk along the coastline at Anarstappi, the ocean far below crashed against the cliffs, with clouds scudding in from the southwest, but we felt ready for anything that morning. 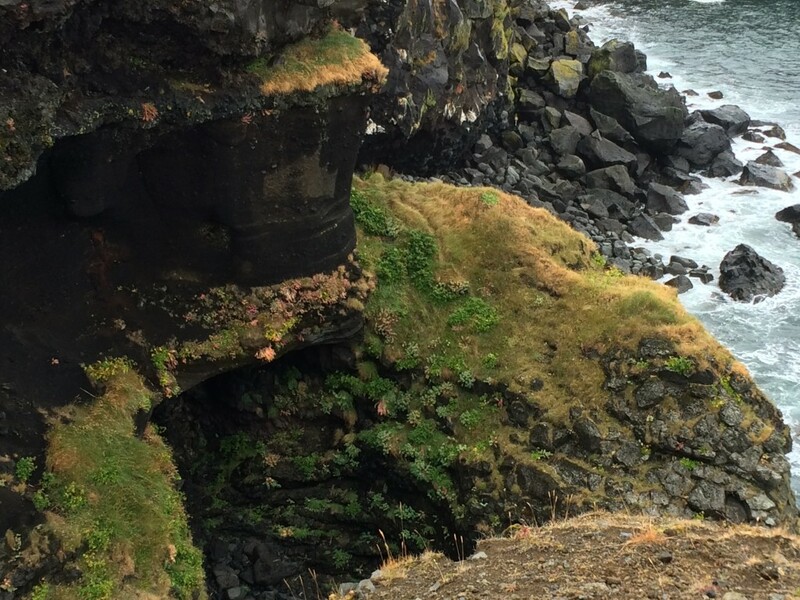 We parked at Arnarstappi and surveyed with bemused curiosity the troll-like arch that initiates the hike (see “Black Rocks, Lava Tubes, and Moonscapes”). Initially the path was well-groomed, but it soon gave way to what many thousands of feet have done to the soft turf. The hike may have been easy at one time, but the soft underfooting has been worn away to expose rocks and mud. I definitely wished I’d been wearing my hiking boots instead of my runners. We saw whales in the distance and tried to get a close-up when they breached, but all you can really see is some white disturbance in the water. 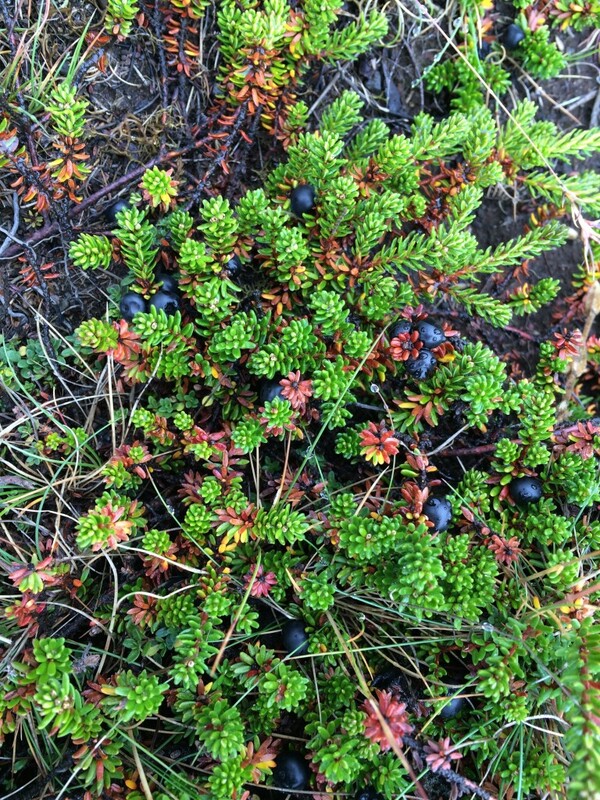 We picked and ate the crowberries growing wild on the hillside. The rainy morning had washed them clean. They were a very mild, slightly sweet flavor with a fairly seedy texture. It would take a long time to get full! They reminded me a little of the Canadian wild saskatoon berries. 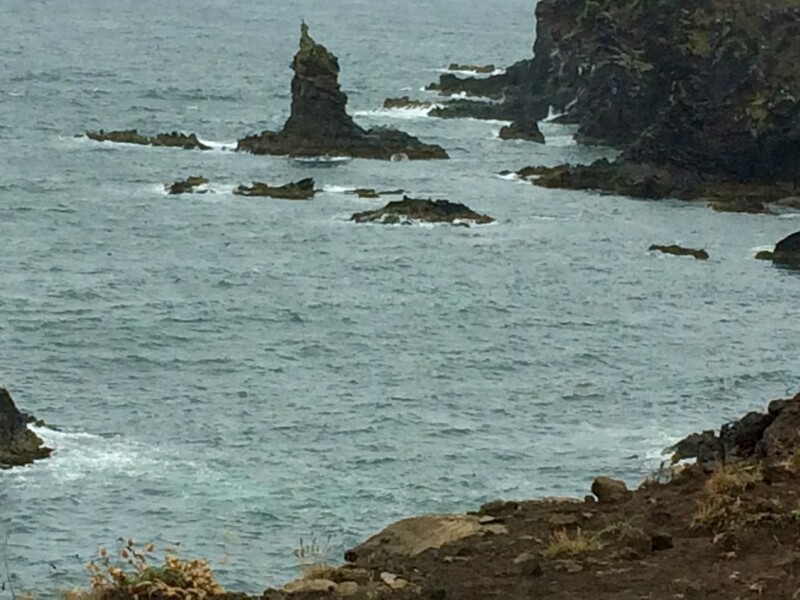 About three-quarters of the way to Hellnar, my youngest daughter offered to run back along the trail to Anarstappi in order to pick up the car and drive to Hellnar to meet us. 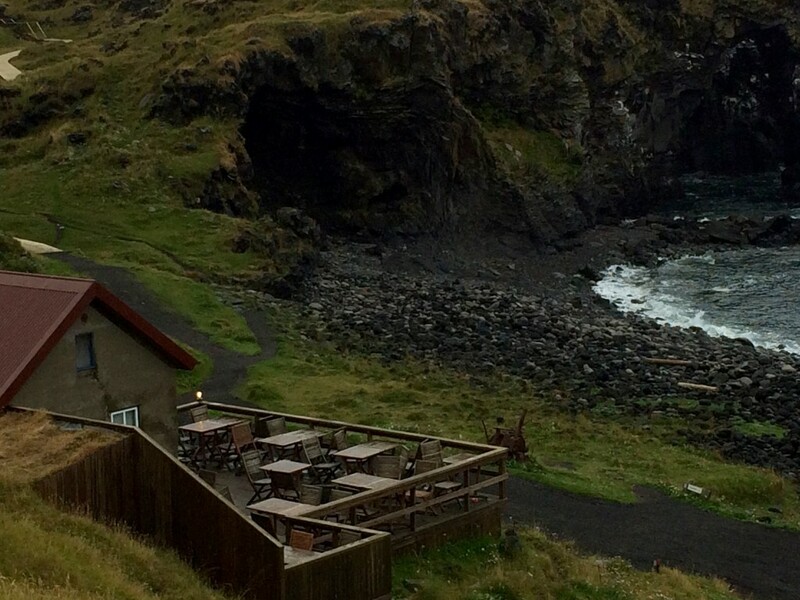 As my other daughter and I approached the Hellnar end of the hike, we came to a little house in a cove that served as a lunchroom. We wanted to take in the view and I needed to rest my bones, but the small room was completely stuffed with bodies, the five or six tables filled. So, we continued on up the trail onto a raised wooden path, and finally to the parking lot. A few minutes later we saw my daughter pull up. She jumped out of the car in half-hysterics. I’d never seen her like that. Granted, she’s dramatic, but she’s never histrionic. Apparently she had very narrowly averted a head-on collision. She had been driving up a hill and shifted into third gear to help our old rental car make it to the top. Suddenly, while navigating a hairpin turn near cliff’s edge, a car came wheeling toward her in the wrong lane. She had only seconds to act and dodged into the other lane. The move no doubt saved her life. It’s hard not to ruminate on the “what ifs?” What if the other car had suddenly changed to the proper lane at the same time my daughter dodged into the oncoming traffic lane? What if she’d been a second too late? What if another car had come along in the correct lane just then? What if the cars had clipped each other and plummeted down the cliff to the ocean? You can’t think like that very long or it takes over your whole body. Once the adrenalin levels had subsided all the way around, we wondered if the other driver had forgotten s/he wasn’t driving in the UK. When do you suppose they figured out they were driving on the wrong side of the road? How much panic did that driver cause other motorists that morning? We found picnic tables along the coast, but the wind drove us back into the car to eat our lunch. We’re in love with skyr, by the way. Why the U.S. makes their yogurt so sweet baffles us. Skyr is perfect! We had camembert on big square seedy crackers, which was excellent. Our second day on the Snaefellsnes Peninsula, we took a morning walk from Stykkisholmur across the stone causeway from the harbor to Sugandisey island. 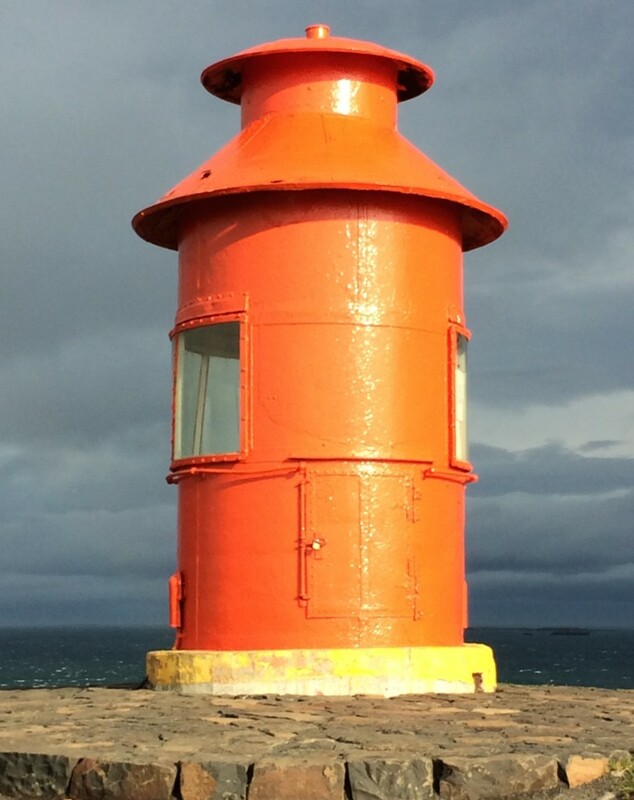 The wind tried to blow us off the hill, but we clung to the lighthouse and took photos. The weather had turned stormy and the play of light and dark in the sky changed from moment to moment. Safely off the island, we wanted to see the Library of Water, a museum consisting of 24 glass pillars of water, but it had been closed for several weeks. Grr! 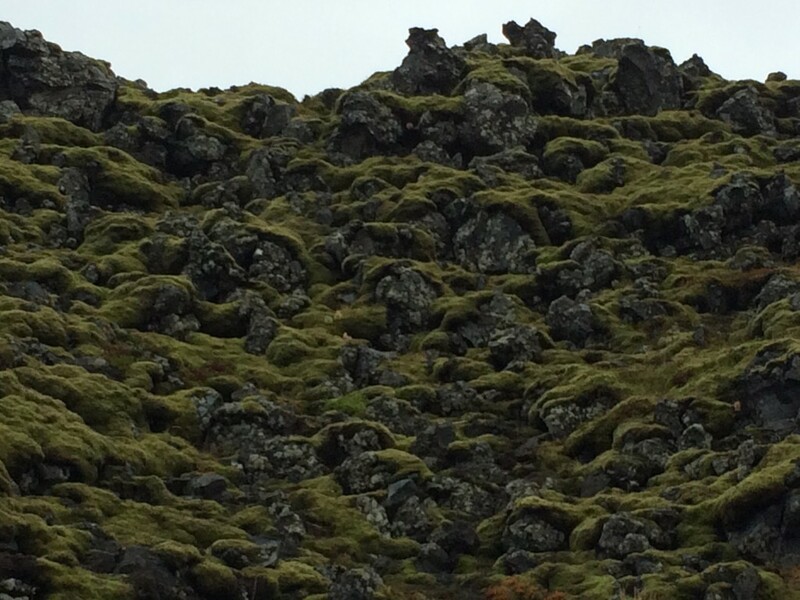 Another reason to return to Iceland.